Khorne clearly owns my soul. I'm working on a Unification-Era project, and decide to add some of the Emperor's foes, gene-bulked techno-berserkers. And then accidentally manage to make new models for my Daemonkin Army. Ah well! Here we have my first three three frothing mad berserkers. I'm no longer clear if they're from pre-Unity Terra, or the Khornate hoards of the 41st Millennium, or from Angron's pit-fighting pals in Nuceria: but they're definitely not just Age of Sigmar Khornate characters any more. 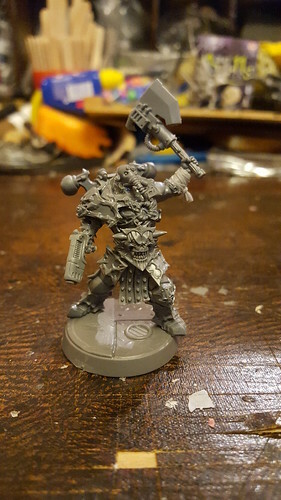 The conversions are all fairly simple: Chaos backpacks, ork nob weapons, Skitarii sicarian heads. Long time, no posting... Sorry about that! 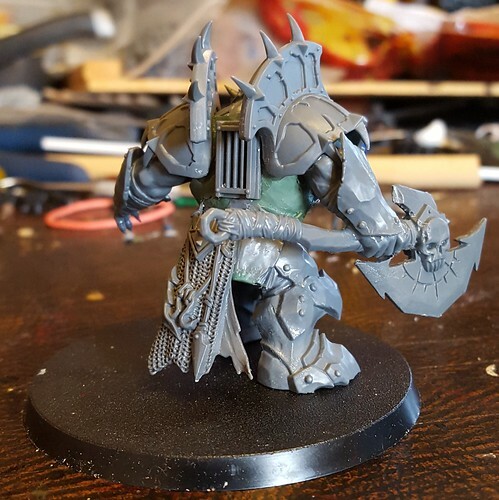 Here's something to make up for it: a conversion of the new Age of Sigmar Orruk Megaboss. 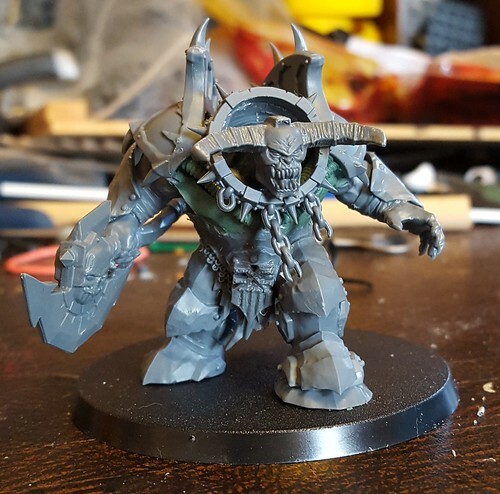 Original plan was possibly for a pre-discovery Angron, but he's just too big and I didn't have a head that fitted which could be Angron (was tempted by the Ogre head with the chainmail face mask for a bit?) Instead he's ended up as a mini-Daemon Prince, some sort of Terminator Lord on the path to ascension. In game I'll probably run him as a Lord-on-Jugger, have him join the Bone Collectors (my Bloodcrushers). He's been a fairly simple conversion. Head and axe head from a Daemon Prince, shoulders are the rear pads of a Forge Fiend, neck is from a Jugger. Plus a load of green stuff to fill the gaps left by not putting on the main torso armour, and a few extra bits & bobs (Khorne icon on his loincloth, DP loincloth on his rear, random grill from somewhere on his back). Look how big he is! I really didn't realise when I bought him, thought he was a bit of a rip-off until I started making him. But no, he's worth it. Of all the races of the galaxy, the Eldar's souls shine brightest in the Warp. 10,000 years ago this led to their doom, when the echoes of their lusts combined to form a new god, Slaanesh, whose birth tore the Eldar Empire apart and created the Great Eye. Ever since, the Eldar have sought to control their emotions, to prevent such an event from happening again. But it is a hard road, and anger is one emotion it is hard to contain. The Rage of the Dying Race is a Herald of Khorne, formed from the overflowing fury of the Eldar: every time that an Exarch screams hatred at their foes; an Exodite vows revenge on aliens who have stepped upon their world; a Corsair spits in fury at an ambush gone wrong; or an ousted Archon curses their exile from Commorragh. Nothing really to say about this guy's painting: I did what you'd expect, pretty much. Brass armour, red for revealed skin, glowing green things, white/grey skulls and helmet: just like the rest of my daemons. 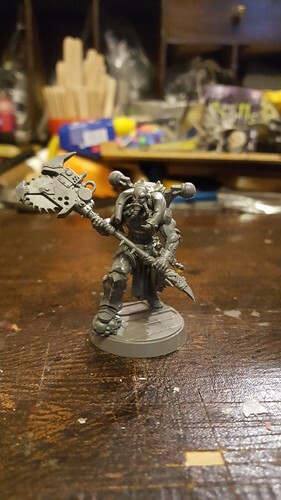 This guy is a Herald of Khorne (because they're such cheap HQ choices! ), who has been formed from the violent thoughts of Eldar. The perversions of the Eldar gave birth to Slaanesh, and now the Eldar have an entire way of life that attempts to deny Slaanesh by entirely focussing on other pursuits. But surely an entire slice of their population being that dedicated to the Path of the Warrior must have some sort of echo in the Warp? I've always liked the idea that there might be links between Khorne and Khaine, as well. Obviously the body of the model is the new Exarch. He was tilted forwards slightly, given arms from Dark Elves and Dark Eldar, a head from the Chaos Chariot, and wings from the Vampire Counts Morghast. It's an odd concept, but was quite fun to make and I was worried that I'd never find anyone suitable for the Chaos Chariot head! It's too elegant to be put on a beastman/cultist/marine body. Hans Kho'ren has always preached that the aim of a Space Marine is to emulate their Primarch. His loyal apothecary, Kagh Bo'orchu, is essential for this. 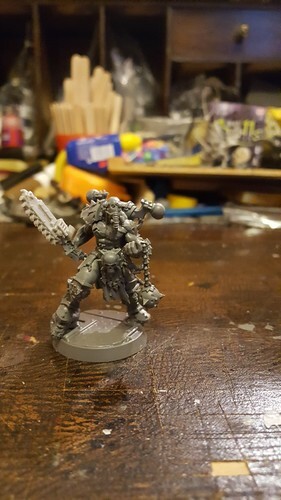 It is Kagh who implants new members of the Skull Takers with the gene-seed and blood of their Primarch to turn them into true World Eaters; Kagh who was one of the first apothecaries to experiment with the Butchers' Nails; and Kagh who, after Angron's apotheosis, studied with Lorgar's Word Bearers to discover the secrets of the Possessed. Kagh's drive to become more like Angron has taken him far from humanity, but his journey is not yet over. Kagh Bo'orchu's right arm still bears the twisted Chaotic remains of his Narthecium, constantly in flux and emitting new spikes as required. His armour is brass, forged to mimic the Armour of Mars worn by Angron, showing he is an important figure in the Skull Takers. On his left shoulder he bears a gladiatorial shoulder pad, in memory of Angron's past; his right shoulder pad is a snarling skull, symbol of Hans Kho'ren's Skull Takers. His helmet is pale and horned, like all in the Skull Takers, in honour of their daemonic patron.